Utah is known for having a run-first offense while historically carrying some fantastic runners on the depth chart. Who would you consider the greatest Utah running back of all time? Each has their own argument for who they should have that title, but I would argue that we are seeing history in the making at Rice-Eccles Stadium right now. I remember a couple of years ago hearing about the “Hallandale Trio” for the first time and being impressed with the recruiting videos that I saw, especially from the Hallandale Chargers running back. Little did I know that the kid from Miami would become the all-time greatest running back to come through the University of Utah. To add detail to why I believe Moss is the best, I’ve gone through my top five running backs in Utah history and broke each players’ stats down to show how Moss stacks up. Before I start my list, here’s some honorable mentions: Jamal “Dirty Bird” Anderson, Carl Monroe, Matt Asiata, Eddie Wide, Darrell Mack, Chris Fuamatu-Ma’afala and Marty Johnson. 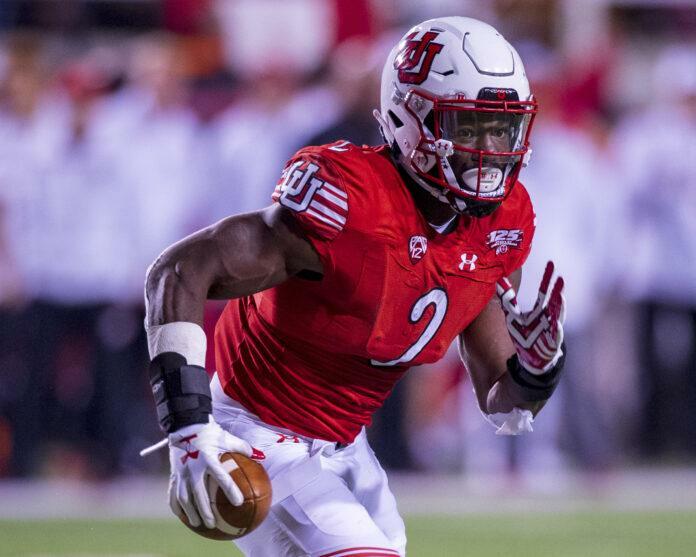 Before Moss, the most recent running back who has an argument to claim the greatest-of-all-time title at Utah would be Devontae Booker, who played for the Utes from 2014 to 2015. Booker had over 250 attempts from scrimmage each season he played for the Utes, finishing with 2773 yards and 21 touchdowns. Utah finished in sixth place in the Pac-12 in 2014 and in third place in 2015. Booker was known for his combination of speed and durability, and his career high in rush yards came when he mowed over a Cal defense on national TV with 222 yards and two touchdowns. One of the best NFL running backs to come out of Utah would be Mike Anderson, who played five seasons with the Denver Broncos and two seasons with the Baltimore Ravens. Anderson was also recently put into the Utah Athletics Hall of Fame. Anderson was shredding defenses as the Utes made the jump from the WAC to the Mountain West Conference in 1998 and 1999. He ran for 2150 yards on 439 attempts during his two seasons on the hill, he averaged 4.9 yards per carry and scored 22 touchdowns for the Utes. Most notably, Anderson is known for his performance against Fresno State in the Vegas Bowl in 1999, where he scored a 34-yard touchdown and broke a Vegas Bowl record with 254 yards rushing while also earning the MVP award. The Wolfman, John White IV, may also make a case to be the best to come through Utah. White was a fast back who took on the bulk of the offense during his two seasons at Utah. White ran for 2560 yards, averaging 4.8 yards per carry and ended with 23 touchdowns. White also helped make the jump to the Pac-12 a little less bumpy for Utah. White helped lead the Utes to a sixth-place finish in the Pac-12 in 2011 and a ninth-place finish in 2012. Many will argue that Eddie Johnson was the greatest to ever come through Utah. I would agree that he is a great choice for that first place spot, but here’s why I would argue moving Johnson to the number two spot and placing Moss at the top. Johnson played five seasons at Utah because a medical redshirt allowed for an extra year after the 1987 season. He rushed for 3219 yards, averaging 5.7 yards per carry and had 26 touchdowns during his career on the hill. Johnson deserves all the credit that he gets for his time here, but another factor outside of stats is when looking at the WAC during that time, the competition was far less than what Utah is taking on in the Pac-12. During three seasons at Utah, two of which sidelined for parts of the year due to injury, Moss has rushed for 2651 yards, averaging 5.6 yards per carry and has 23 touchdowns. He also played a major role in getting Utah to its first ever Pac-12 championship game. If Moss stays healthy throughout his senior season and makes no improvement from his averages from his two starting seasons at Utah, he is on pace to rush for 3,786 yards, average 5.8 yards per carry and score 34 touchdowns, leaving Johnson’s records in the rearview mirror. The scary thing to me is that the kid with a lot of potential coming out of Hallandale High School still has untouched potential going into his senior season at Utah. Records will be broken, new milestones will be met and a running back we’ve come to love will solidify himself as the greatest Ute at his position. Finally, a PSA to all defenses going up against the Utes this year: buckle your chin straps.